Lycia et Pamphylia was the name of a province of the Roman empire, located in southern Anatolia. It was created by the emperor Vespasian (reigned AD 69- 79), who merged Lycia and Pamphylia into a single administrative unit. 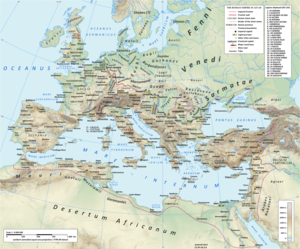 In 43 AD, the emperor Claudius had annexed Lycia. Pamphylia had been a part of the province of Galatia. The Roman provinces of Asia Minor under Trajan, including Lycia et Pamphylia. 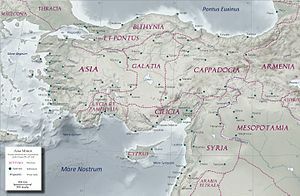 The borders drawn by Vespasian ran west of the River Indus (which flowed from its upper valley in Caria) from the Pisidian plateau up to Lake Ascanius (Burdur Gölü), to the south of Apamea. In the north and east it formed a line which followed the shores of the lakes Limna (Hoyran Gölü) and Caralis (Beyşehir Gölü), turned south towards the Gulf of Adalla (mare Pamphylium) and followed the Taurus Mountains (Toros Daǧlari) for some ten miles towards east up to Isauria. It then followed Cilicia Trachea to reach the sea to the west of Iotape. The borders were dawn taking into account geographical and economic factors. The whole of the basins of the rivers Xanthus, Cestrus (Ak Su) and Eurymedon (Köprü Irmak) were included. The main cities were at the mouth of the latter two rivers. In Pisidia e in Pamphylia they were in part followed by the few roads into the interior of Anatolia. The most important one was the road from Attalea (Antalya) to Apamea. In Lycia the road from Patara towards Laodicea on the Lycus followed the coast. Important cities were Side, Ptolemais, Gagae and Myra on the coast, Seleucia, inland and Cremna, Colbhasa and Comama,on the Pisidian Plateau, where Augustus had founded Roman colonies (settlements). on the Milyas plateau there were Oenoanda, Tlos, Nisa, Podalia, Termessus and Trebenna. Other important cities in Lycia were Pednelissus, Ariassus e Sagalassus; along the Eurymedon, Aspendus and Perge, which had a sanctuary of Artemis. The most important city in the region was Patara, at the mouth of the Xanthus. Under the administrative reforms of emperor Diocletian (reigned AD 284-305), which doubled the number of Roman provinces by reducing their size, the Lycia et Pamphylia province was split into two separate provinces. The provinces were grouped into twelve dioceses which were under the four Praetorian prefectures of the empire. Lycia and Pamphylia were under of Diocese of Asia (Dioecesis Asiana), of the Praetorian Prefecture of Oriens (the East). ^ Şahin, Sencer; Mustafa Adak (2007). Stadiasmus Patarensis. Itinera Romana Provinciae Lyciae. Ege Yayınları. pp. 85–93. ^ Fatih Onur (2008). "Two Procuratorian Inscriptions from Perge". Gephyra. 5: 53–66. Fatih Onur (2008). "Two Procuratorian Inscriptions from Perge". Gephyra 5: 53–66.